OXFORD, Miss. — When they roll into Oxford for a 6:30 p.m. (CT) contest on Thanksgiving night, the Mississippi State Bulldogs will be looking for a taste of revenge from last year’s 31-28 defeat at the hands of Ole Miss. Although the Bulldogs (7-4, 3-4 SEC) have been dominant at home, going 6-1, they have struggled mightily on the road, notching a 1-3 record. They enter Thursday night’s game as 11-point favorites, but you can be sure the Rebs won’t back down. 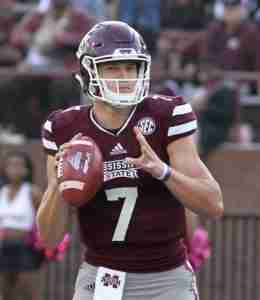 If you’ll recall, State was a 14-point favorite over the Rebels last year in Starkville. Preseason Heisman Trophy candidate QB Nick Fitzgerald has been inconsistent all season for the Bulldogs. He has notched 901 rushing yards on 183 attempts with 10 touchdowns, which is good for fifth in the SEC. He’s also the all-time leading rusher in SEC history at the quarterback position. However, Fitz is dead last in the SEC among starting quarterbacks with a 51.9% completion percentage and 1504 total passing yards. Fitzgerald is the center of attention for the Bulldog offense. They play as he plays. When he is able to complete passes on a consistent basis, his State team is an extremely tough group to beat. Ask Texas A&M about that. Fitz plays hard with a lot of passion, but he can be stopped–which can stall their offense. Running backs Kylin Hill and Aeris Williams complement each other’s skill sets and take the majority of the handoffs. Hill has tallied 583 rushing yards on 88 attempts with 3 touchdowns, while Williams has garnered 438 rushing yards on 68 attempts with 2 touchdowns. Hill is questionable with an ankle injury for Thursday after missing Saturday’s game against Arkansas. Fitzgerald takes the majority of the runs, but these two are expected to get plenty of touches depending on Hill’s availability. Osirus Mitchell and Stephen Guidry are Fitzgerald’s favorite targets. Each receiver is 6-foot-4, which can cause a mismatch for defensive backs. Mitchell has 385 receiving yards with 4 touchdowns and Guidry has 362 receiving yards with 3 touchdowns. If the Bulldogs are able to complete passes to these two, it could open up the Bulldog offense. Tight end Justin Johnson is third on the team with 233 receiving yards and a touchdown, while Deddrick Thomas has 217 receiving yards with one touchdown. Hill can also be utilized in the passing game and has notched 152 yards with three touchdowns on the year. The Rebel defense should expect the Bulldogs to try to establish the run early in order to set up the pass. State wants to avoid long third downs since Fitzgerald has shown some inconsistency in keeping the chains moving. Once the Bulldogs are in the red zone, Fitzgerald likes to keep the football, so Ole Miss will try to key on him. 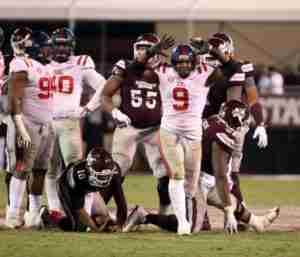 The Landshark defense needs to force the Bulldogs into a one-dimensional offense. In State’s four losses, they have only scored a combined 16 points because teams were able to take away Fitzgerald’s legs and force him to make throws. Additionally, Fitzgerald has only averaged 107 yards through the air in his team’s four losses, so it is important for the Rebels to control the line of scrimmage early and make him feel uncomfortable from the get-go, like last year. Remember, Rebel fans, Fitzgerald threw an interception deep into Ole Miss territory before he was injured last year, so it can be done. Mississippi State boasts one of the best defenses in the nation; they are ranked No. 4 in the country in total defense. Many preseason analysts selected the Bulldogs as the best front seven in the SEC, and the group has not disappointed. They are third in the SEC with 32 sacks and have forced the most the sack yards in the SEC (256). The two leaders of State’s defensive line are Jeffrey Simmons and Montez Sweat, who will both most likely play on Sundays next year. Simmons, who is not a stranger to the Ole Miss fan base, has amassed 55 total tackles and 13.5 tackles for loss. Sweat has totaled 45 tackles with 12.5 tackles for loss, including 10 sacks. These two are game-changers. They control the line of scrimmage and disrupt an offense’s rhythm. State’s defensive line is the reason the Bulldogs have the 13th-best rushing defense and the fourth-best total defense in the NCAA. They are nearly unblockable at times, so the Rebels need to get a grasp on these two defenders to allow the offense to flow. Note: Ole Miss senior center Sean Rawlings will be playing against Simmons for the third year when the two meet Thursday. We bet you didn’t know that in the prior two meetings between the two (2016 and 2017), Rawlings has held Simmons to a total of zero tackles–yes, zero tackles. Simmons has a grand total of 3 assists in two years against Rawlings. 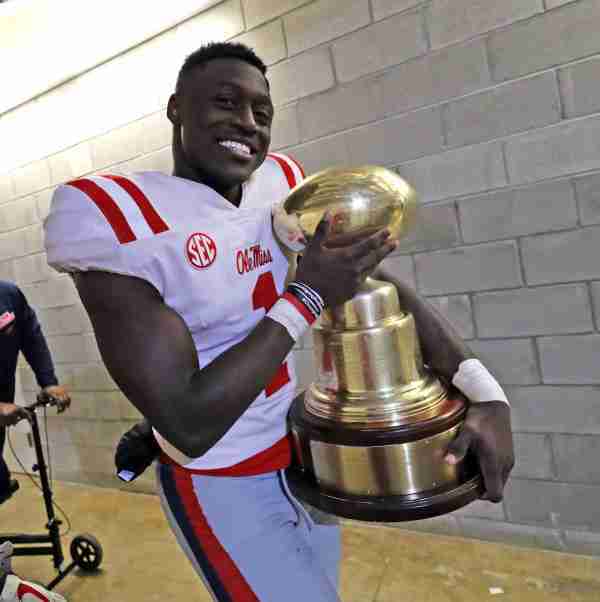 While we know Rawlings was hurt in the Vandy game, suffering an ankle injury, we also believe there won’t be much that can keep Sean off the field for his final game in an Ole Miss jersey. The Bulldogs linebacking corps is not lacking talent with Erroll Thompson, Willie Gay, and Leo Lewis. Thompson has been the most outstanding linebacker for the group with 77 tackles, 7.5 tackles for loss, 3.5 sacks, and 2 interceptions. Gay has 44 tackles with 5 tackles for loss along with 4.5 sacks. Leo Lewis has 41 tackles with 3 tackles for loss. This unit has good size and speed and will fly to the football and make their presence felt. They are enforcers and are good at making plays in the open field. Each was heavily recruited by a variety of schools–and for good reason, because they are difference-makers. Mississippi State’s passing defense is the sixth-best in the nation, giving up an average of only 165.3 yards per game. This is due to a veteran secondary that has played together for years. Mark McLaurin, Jamal Peters, and Johnathan Abram are all senior starters. Cameron Dantzler is a sophomore cornerback who is long and meshes into the senior group well. The secondary has improved from the year before, but they could have their hands full with Ole Miss’ Nasty Wide Outs. 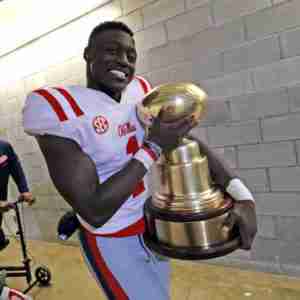 Ole Miss WR with the Golden Egg Trophy. Quarterback Jordan Ta’amu is going to need to have a big game and protect the football. The Rebs can’t throw an interception, or the game could get out of hand. Ta’amu will need to use his legs on third down to avoid pressure and keep the chains moving. A.J. Brown (a.k.a. The Mayor of Starkville) will need to have another prolific game, especially with fellow NWO DaMarkus Lodge nursing an ankle injury. Brown will be keyed on by the Bulldogs’ defense, especially with the injuries. Expect for him to have many quick passes thrown his way early. Ole Miss needs an unsung hero to rise to the top. Look for the Rebels to attempt to utilize tight ends Dawson Knox and Octavious Cooley. These two are big, athletic freaks that could pose as potential mismatches on third down and in the red zone. 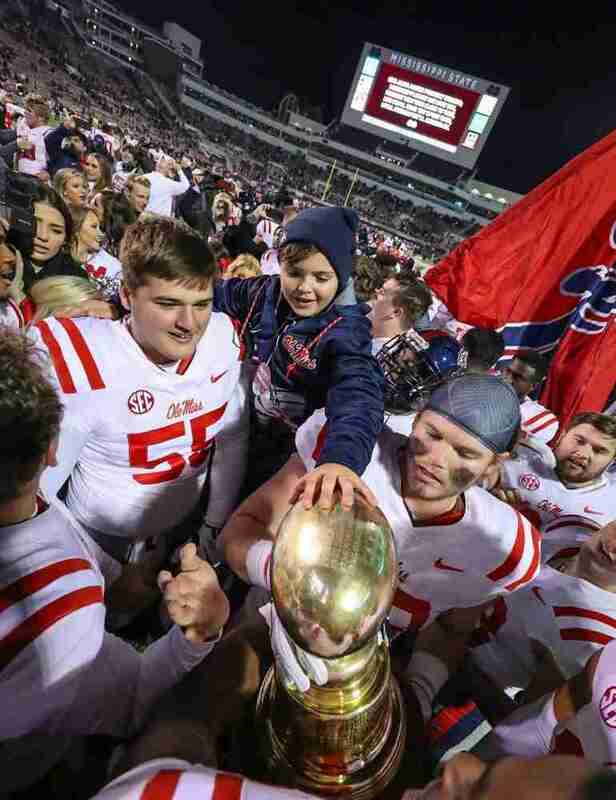 Each of them might need to score a touchdown apiece if the Rebels want to give the seniors a final victory and maintain possession of the Egg Bowl Trophy. Hays Dubberly is a sophomore Ole Miss student from Jackson, Mississippi. Hays is majoring in Biochemistry with a minor in Math. He is a fan of the Atlanta Braves, New York Giants, and any team in the Ole Miss athletic department.